Welcome to the first entry in the ‘Learn program C++ with C++Builder’ series - a set of five articles taking you from knowing nothing about C++ to writing a real-world, useful application. 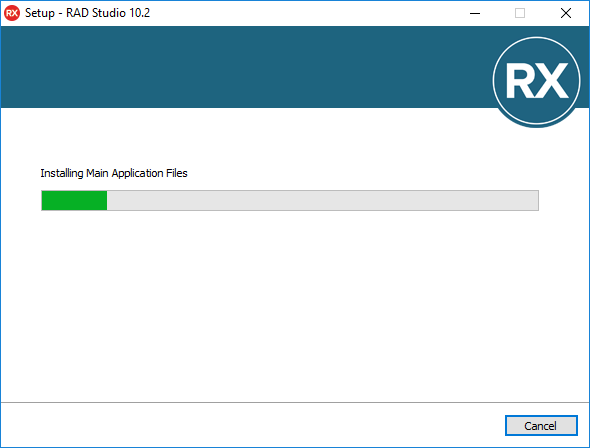 I’m David Millington, the C++Builder Product Manager, and in parallel we have the same series and same app in Delphi. We have posts taking you step by step through programming in the two respective languages, with Delphi and C++Builder. We’ll be taking you through from the very beginning, assuming you know no Delphi or C++ at all, and show you how to build a real-world, useful application - we’re currently thinking a scientific calculator, because it demonstrates UI, UI and logic separation, and many useful classes like stacks and utility methods, ie is a great overview of many areas you need to know about. One really neat thing is that you can use both languages together in one natively compiled application, something we won’t show in this series but is one of the amazing integrations our tooling offers. Today’s post is an introduction and will show you how to install C++Builder Community Edition - this is a free and fully-featured edition - and then next week we’ll dive into code. We are assuming that you know some programming basics: we’re not going to explain what a class is, for example, but instead will show how to write and use one in C++. C++Builder is a particularly powerful C++ platform, because not only does it give you C++ (of course), but it includes a large variety of libraries and frameworks that other C++ tooling does not. This includes tools for writing cross-platform user interfaces, including using native controls; database access for several dozen databases in a very clean and powerful library; REST, JSON and other web frameworks; and more. The libraries and frameworks are fast to use - we find that users who know our tooling can achieve polished and complete applications in fractions of the time it takes using other IDEs, whether that be C++ or other languages like C#. The end result is you can build an application once, including designing its UI for multiple platforms, and deploy it - natively compiled - to Windows, iOS, Android, and macOS, fast. So let’s get started! Today’s post is an introduction to the series, and shows you how to install C++Builder Community Edition. 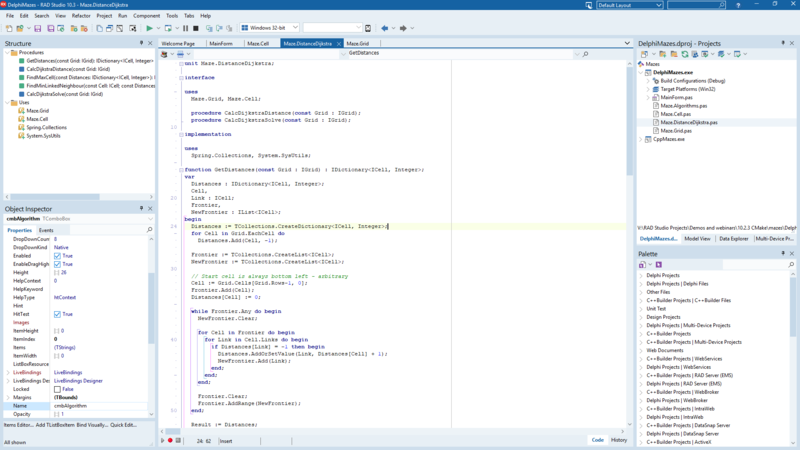 The following four posts will introduce you to the IDE and to C++ itself, and then go on to develop a real-world, cross-platform, useful application. Let's install C++Builder Community. It's free - go download it now! Important note: The 10.2 Tokyo Community Edition does not co-exist with any other edition (SKU) of 10.2 Tokyo. 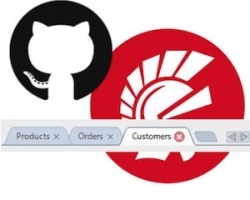 Ie, if you have Delphi 102 Pro, you cannot install 10.2 Community. On the other hand, if you have 10.1, ie another version, they co-exist fine. It's just that Community Tokyo doesn't co-install with AnythingElse Tokyo. 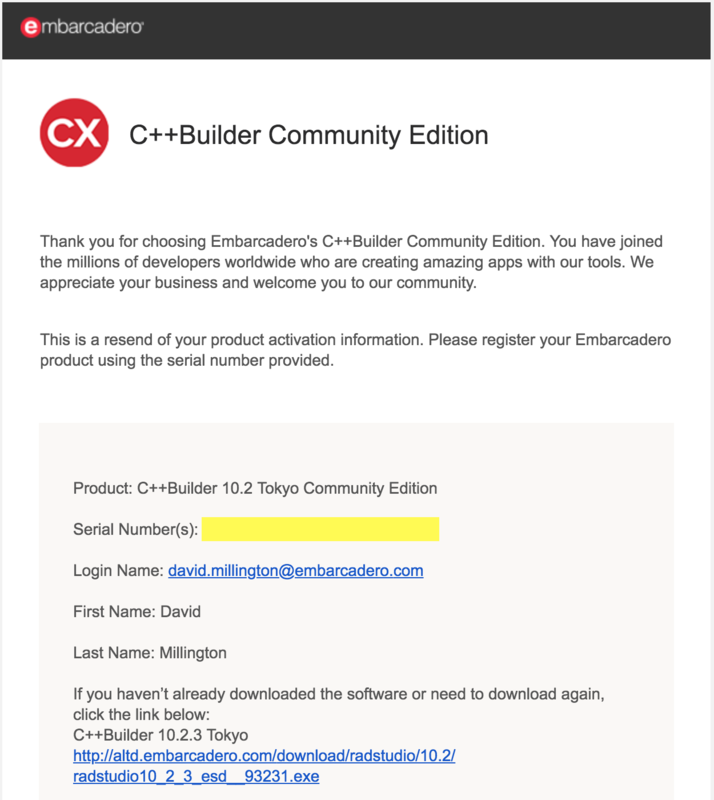 If you have, say, Delphi 10.2 Tokyo Pro (or Community) already installed, install C++Builder Community on another PC or in a virtual machine. 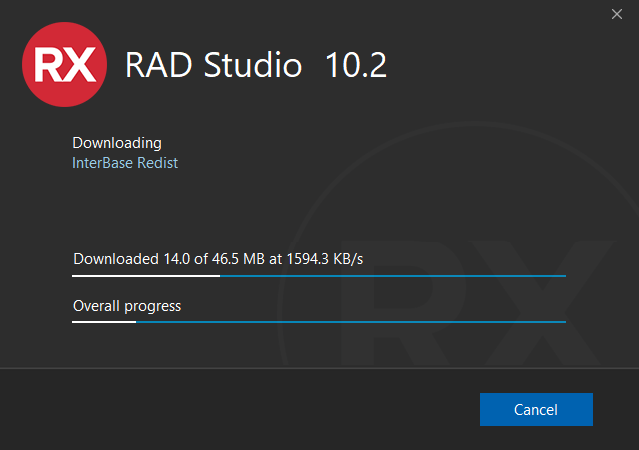 If you want both, you can always download the RAD Studio trial instead - it includes both C++Builder and Delphi. When you visit that link, you will be asked to create an EDN account if you haven't already got one. 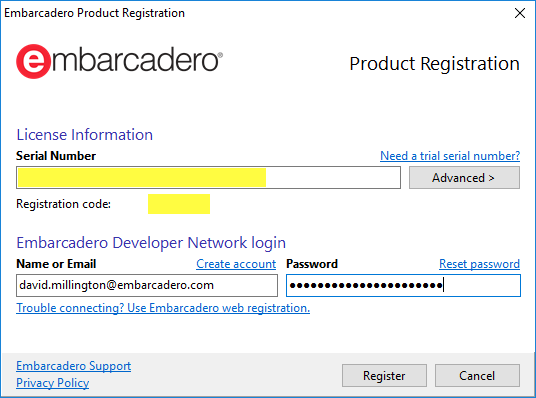 EDN is the Embarcadero Developer Network. Go ahead and fill in the info, or if you already have an account, click the Login text in the middle right to just enter your email and password. Once done, you'll get a download automatically starting, and a notice that you've been sent an email with your license key. 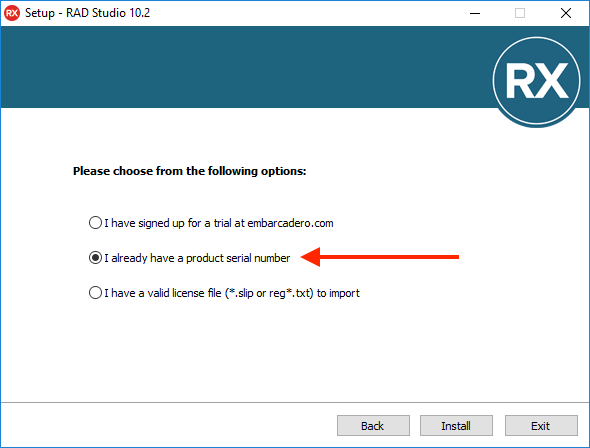 When you click Next, you might see a regular install progress window for a few seconds, but pretty soon you'll be asked for the serial key in a popup dialog. Enter it in the top section, and your login details from when you downloaded below. Pretty soon, you'll be greated with this really pretty window. This is where you select the "personalities" and platforms that live in the IDE. 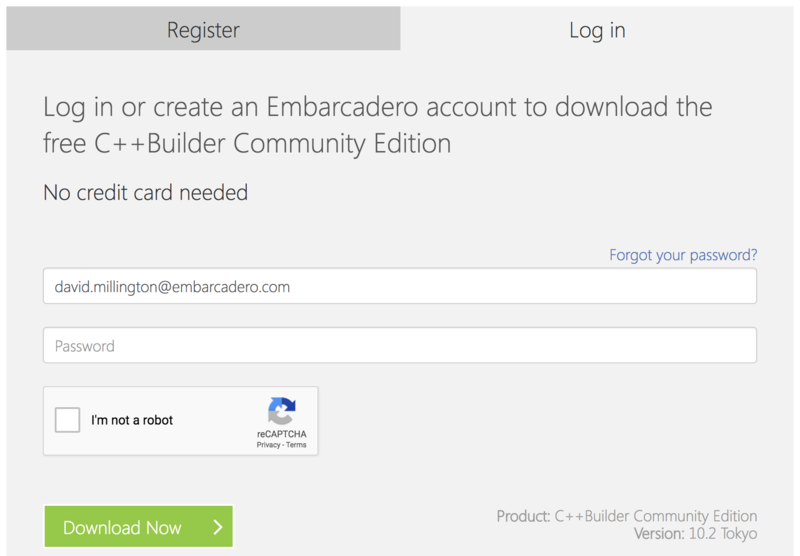 Since you've downloaded C++Builder Community, you can install Windows, macOS, iOS, and Android. I recommend at least Win32 and Win64. Select the ones you need, and click Continue. On the next page, you can click through, but I'd recommend you select to install samples and help. 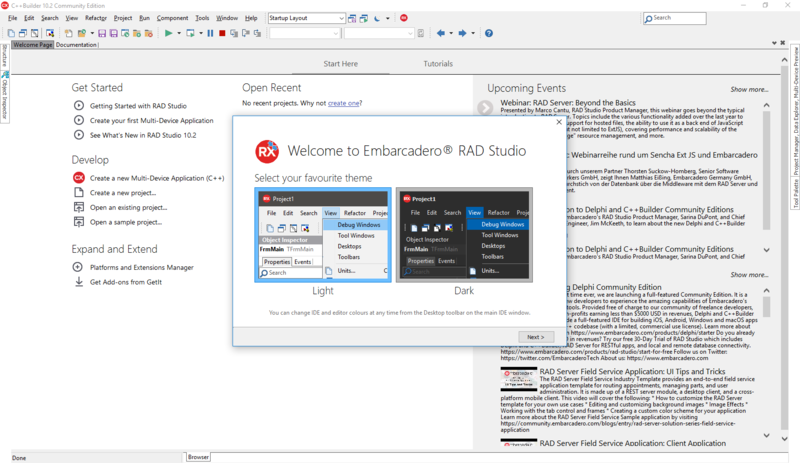 The samples are useful demo programs we ship to demonstrate various features, libraries, etc. The help gives you a language reference, information about the various libraries and classes, the various parts of the IDE, etc. 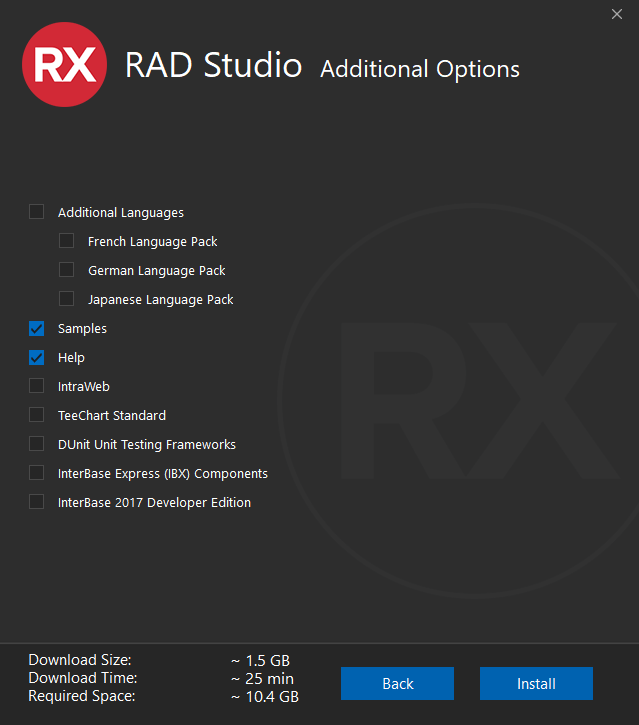 If your version of Windows is set up to use another language, you should also choose to install that language (if available) so you see the IDE properly localized. For example, if you're a native German speaker, select the German language pack. Then it will install. This should go by very quickly - the installer you're seeing is known as the GetIt Feature Installer, and it uses GetIt, our package manager. This might take a while. Sorry. It's not ours. Success! 'Start working', now that's a good button to click. And in a moment, you'll have the IDE! Congratulations! You're installed, and ready for the next post digging into the IDE. In this screenshot, you can see what the IDE looks like when you first start, allowing you to choose a light or dark theme (which you can choose at any time from the moon icon on the toolbar). We also have the Welcome page in the background, which gives you fast access to recent projects or new projects, a few online samples from our package manager (GetIt, also look in the Tools menu), and news about events and recent Youtube videos. So what is Community Edition after all? Is it free? Can it be used commercially? Can I use it as a student? What about writing programs at home? Community is a fully-features version of C++Builder. It is equivalent to our Professional edition, including support for mobile platforms. 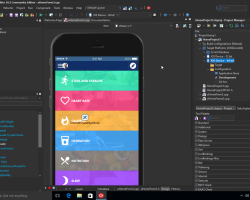 You can visually design for Windows and cross-platform; debug applications including on-device; build apps with local or embedded databases; and use hundreds of components to enhance your app. There are some key restrictions. Consult the EULA for full information - this is not legal advice - but roughly, you can use it until you make $5000 revenue from programming, or until you have 5 developers. Ie if you make enough money to buy it, please buy it; if you have lots of developers, buy it. There are a few other ones, such as not using it for a build server. Consult the EULA, but we hope these restrictions are fair. 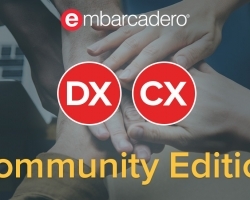 Community is intended to get people started with Delphi or C++Builder, and be there for you if programming is not a serious part of your income, and that can be either getting started with programming in general - such as a student - or for starting something else, such as writing software for your startup company. Individual developers, hobbyists, students and developers who are learning new programming languages, starting to develop cross-platform apps, or learning the IDE - it's for you. Early stage startups without revenue yet - it's for you. Spreading the word about Delphi and C++Builder - Community is great for that. So if you’re a hobbyist or at-home developer, coding for fun? It’s free. Enjoy! If you’re a student? It’s free. Enjoy! If you’re a startup? It’s free, but once you start getting incoming revenue or growing, you need to move to Professional or above. 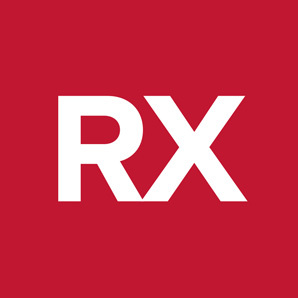 If you’re an existing company? You may find the revenue / commercial use options mean that Professional, Enterprise or Architect are a better option for you. 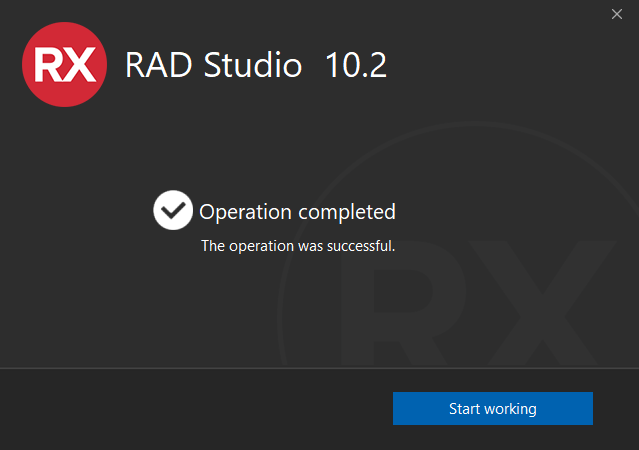 Remember there is always the fully-featured trial version if you just want to try RAD Studio out. What if you don’t qualify for C++Builder Community Edition? 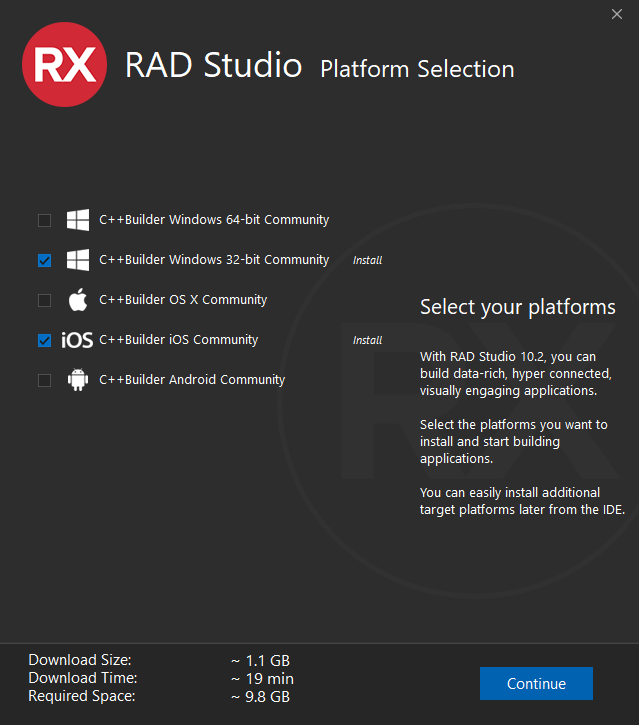 You can complete this series with a FREE 30 DAY Trial of RAD Studio, which includes C++Builder Architect trial. We’re very glad you’re using our products, and this series of blogs is a great resource to get you started. I have already installed it. I checked all tne options available in the Windows SDK installer. I tried to build a HelloWorld Console Application in C++, or run the samples. It's imposible. Always appearing the same error. I am using a 64 bit Windows 10 machine and appears this error: [Error Error] Invalid PLATFORM variable "MCD". PLATFORM must be one of the following: "Win32", "Win64", "Android", "iOSSimulator", "iOSDevice32" "iOSDevice64", or "OSX32", or "Linux64". 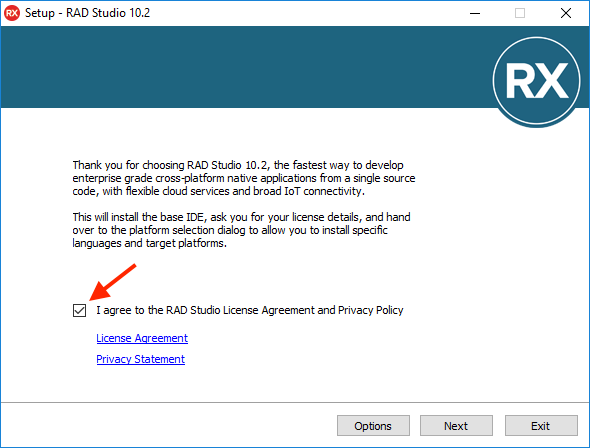 If PLATFORM is defined by your system's environment, it must be overridden in the RAD Studio IDE or passed explicitly on the command line to MSBuild; e.g., /p:Platform=Win32.